Tile Cleaners Sydney® is your specialist service provider for all marble tile & grout cleaning, stripping & sealing. If you need advice on how to clean your old or brand new marble surfaces and tile grout, and how best to reseal your marble so it stays looking new, or need a professional to do it for you, then you have come to the right place. 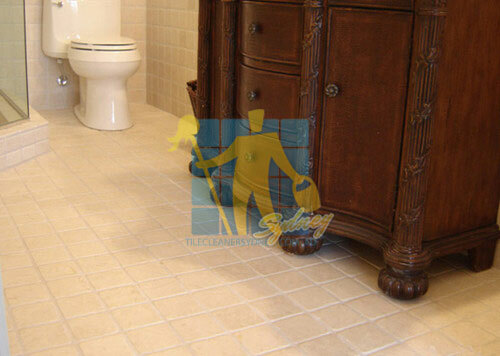 All porous tiles should be sealed, sealing your marble will help prevent & reduce staining. Sealing will keep most stains suspended at the surface of your marble creating a barrier that provides protection against chemical attack, deterioration and contamination. Sealing is the first important step towards protecting your marble against stains. All natural stone needs some type of care and maintenance. We know marble and understand and appreciate its distinct characteristics, providing the specialist care your surfaces deserve. Marble is a natural material and a relative of limestone which requires special care both because of its high value and because it is unfortunately prone to scratching and staining. Marble is porous and will absorb liquids and oils, leaving stains under the surface that can be very difficult to remove. The acidic nature of many substances around the house can instantly etch the stone. Fruit juice, sauces, soft drink and acidic cleaning products coming into contact with marble puts it in danger of permanent staining. Admittedly you can clean commercial marble with any number of generic cleaning agents but without the help of professional marble polishing and restoring machines it is virtually impossible to keep your valuable marble floors pristine. Marble and natural stone restoration is a highly skilled job as stone can be ruined very easily by an inexperienced tradesperson. Our mission is to provide the most professional workmanship and good old fashioned customer service that is the envy of our industry. Unlike other companies that offer a limited 'one process suits all' service, we provide a tailor made service to solve almost any problem your stone may have. Marble is one of the most beautiful surfaces anyone can have in their home or office, however it is a relatively soft stone and because of this it can easily scratch in high foot traffic areas. A regular maintenance program is vital if the floor is to retain its original beauty, which was achieved in a factory by grinding and polishing the marble to a mirror finish. Special care is required when cleaning marble. 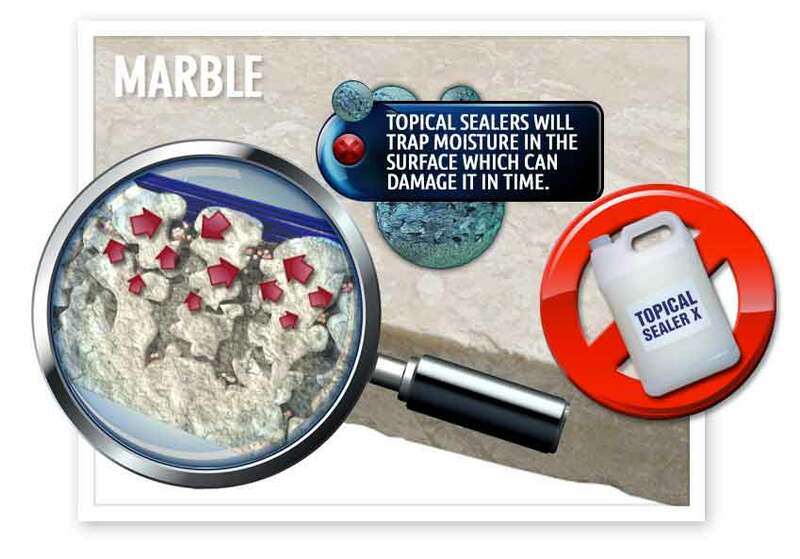 Sealing your marble will keep most stains suspended at the surface, creating a barrier that provides protection against chemical attack, deterioration and contamination. Deepshield™ Gold ultra premium sealer is specially designed to penetrate denser materials such as marble, granite and porcelain, offering peace of mind by forming a barrier between the micro pores of your porcelain and potential water and oil based stains while preserving the tile's appearance and resulting in maintenance being made much easier. A deep penetrating impregnating sealer protects marble and grout from water and oil based stains by chemically reacting with the surface pores using nano-technology to create a breathable protective barrier. An impregnating sealer will protect the marble surface and grout from absorbing stains while also resulting in cleaning and maintenance becoming much easier. Australia's Deepshield® range of impregnating water based sealers offer long term benefits; Deepshield Gold® is based on the latest fluoro-bond technology and will last for up to 15 years. A penetrating impregnating transparent sealer enters the pores of your stone and once cured will not change the look of the tile or stone. Tile Cleaners Sydney® are experts at applying all types of sealer and will ensure your marble looks its absolute best. Tile Cleaners Sydney® can apply a topical sealer when especially required to create a high gloss, satin sheen or matte finish to your surfaces. Topical sealer is also helpful in situations where old solvent based sealer cannot be completely removed or when required to hide certain types of damage. Topical sealer's have a life expectancy of around 3 years. 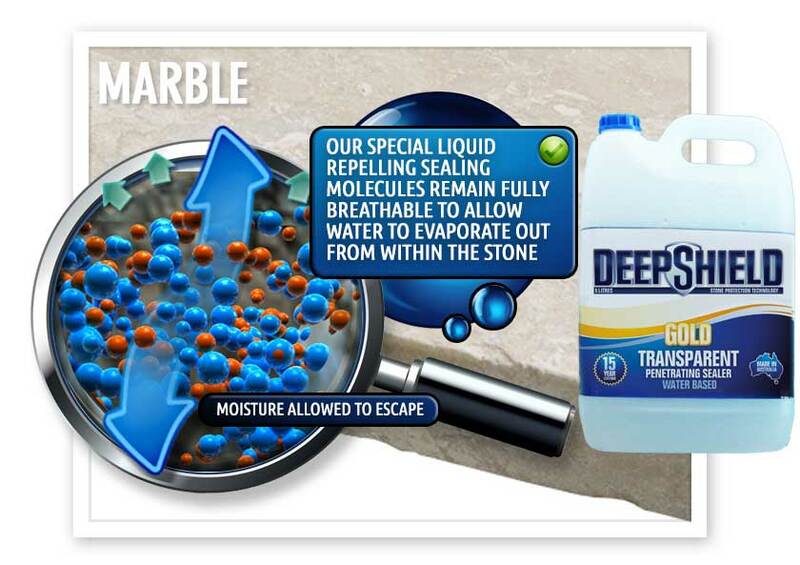 You can easily test how porous your natural marble is by applying a drop of water to the surface and watching how the water is absorbed by the marble. You can then see how any type of water based stain can be absorbed by the marble tile surface and grout. As years go by, many fine marble floors become scratched and stained. Our team utilise the most modern equipment to restore years of wear and tear, bringing even the most tired and damaged marble surfaces back to life. With our expertise and modern equipment, having your marble floors restored today is more affordable than ever. Let our experts fix the damage! Using state-of-the-art equipment, Tile Cleaners Sydney® unique cleaning methods tackle even the most difficult floors. Our quipment can handle both domestic and commercial jobs, leaving your floors spotless and hygienic. 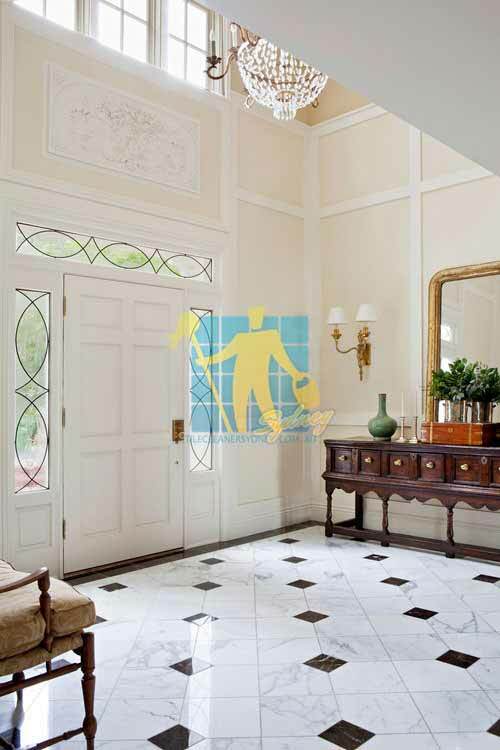 Serving all of our new and existing clients with timely, flawless and hassle-free marble cleaning services, we have earned our quality reputation in the cleaning industry. Marble is one of the most beautiful surfaces available in the home or office; however, being a fairly soft stone it can easily become scratched in areas of high foot traffic. A regular maintenance program is vital if marble is to retain its original beauty, achieved in a factory by grinding the stone to a mirror finish. Special care is required when cleaning marble. 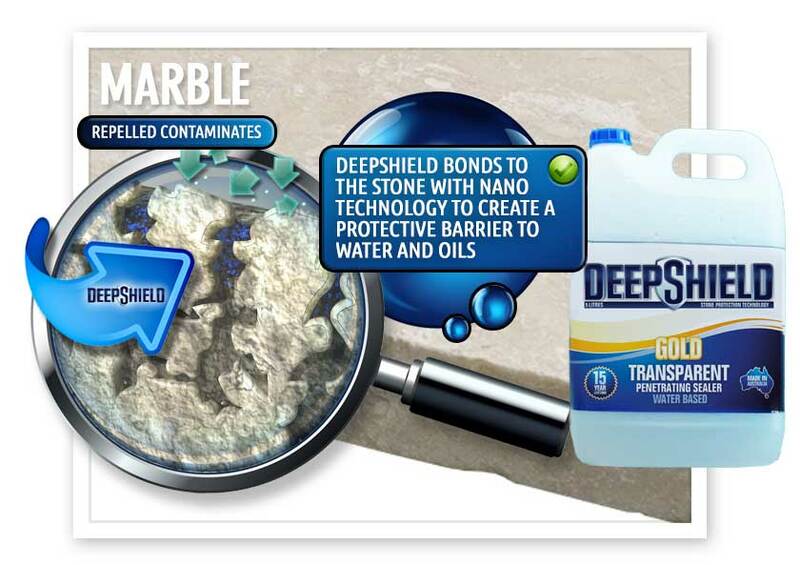 Deepshield™ Gold impregnating sealer lasts for up to 15 years and cures deep inside the pores of your marble leaving an invisible protective barrier that will result in maintenance becoming much easier. Unsealed or weakly sealed marble will soak up oils, spills, and stains. To check whether your marble is sealed, leave a few drops of water on the surface. If after a few minutes the water has soaked into the marble, then it's time to reseal the stone. Don't allow an accident to permanently stain your beautiful surfaces. Sealing is the first important step towards protecting your valuable surfaces from stains. Spills should be cleaned immediately. You should generally use only warm water and a mild detergent on your marble floors and never use vinegar on marble. The acid in vinegar can seriously damage and actually etch and remove the surface of marble. After mopping, dry the floor with a cotton towel or use a sh-mop to remove the moisture and prevent water spots. Always dry your marble floors as they spot very easily. Q: Why is it important for me to have my marble tiles sealed? Q: How do I know if my marble floors need sealing? Q: What kind of sealer do you apply? And will it affect the texture of my marble tiles? Q: Will the colour enhancer affect the texture of my marble floors? Q: What is the process I can expect when you come to re-seal my marble floors? Q: How long will it take to reseal my marble floors? Q: How long does it take for my marble tiles to dry? Q: Will the sealer make my marble floors slippery? Q: What is acid etching and how can I protect my marble against it? Q: Which different marble tiles do Tile Cleaners Sydney® seal? Q: How often should I seal my marble floors? Q: What happens if I do not seal my marble floors? Q: There is a stain on my Marble floor. Can you remove it? Q: Does sealing my marble floors hide scratches and etches? Q: What can I do to keep my marble tiles looking new after sealing them? Q: How will you charge me for sealing my marble tiles? Q: How do I measure the size of the area of marble I need sealed? Q: What should I do to prepare my marble floors before sealing?